The Dura Dry Waterproofing System is a drain system that is installed along the interior of the foundation where the wall and floor meet. From there it collects water that enters from either the floor joint or cracks in walls. The Dura Dry Waterproofing systems collect water through two drains. Water that runs through or down foundation walls is channeled through the upper Wall Drain into the lower Footing Drain. The Lower Footing Drain then collects the water from the Upper Wall Drain, water that comes from the joint where the footing and wall meet, water that flows from below the footer, and water that comes from below the floor slab. Once the water has made it into the Lower Footing Drain it is then channeled to a sump pump basin or discharged to daylight if possible. Installing a good drainage system like the Dura Dry Waterproofing System is only part of the battle when it comes to getting water out of your basement or crawlspace. Using a quality sump pump and high-efficiency basin are just as important. If your system does what it is designed to do then it is going to collect water, sometimes a lot of water, and you have to get it discharged as quickly and efficiently as possible. By combining our high-efficiency Bell Basin with Pro Series commercial grade sump pumps you have the best of both. For stone foundations, the wall must be covered with a wall wrap to ensure the water from the wall makes it to the Upper Wall Drain. All foundation walls can be covered with our wall wrap and in many situations, it creates a much more healthy environment for the whole home and gives the basement a cleaner more finished look. The Dura Dry Waterproofing System is a tried and true system that comes with a lifetime guarantee against future water intrusion. Many companies have their own version of this system and the truth is that when installed properly most of them will work. The key is to find a company that will use quality materials and highly trained crews to do it correctly the first time. At Foundation 1 you will get the best from us every time and you will get the best materials installed by the best crews in the Midwest, all backed by the best warranties in the industry. Take a look at some waterproofing project photos, click here! The DuraDry™ interior basement waterproofing system from Foundation 1 can be a major system to help keep your home dry! The system works by collecting any wall water into a drainage system at the base of the wall, then moving the water to a sump pump where it is pumped out of the home and away from your foundation. Installing such a system involves breaking about six inches of the concrete floor slab out at the base of the foundation wall. We then dig out enough dirt to place drainage pipe under the slab next to the foundation footing. We replace the dirt with gravel. The “secret” to the system is to install a dimpled plastic insert at the base of the foundation wall, which allows water to flow through from the wall into the drainage pipe after the concrete floor slab is replaced. So, does water still come down the wall? Yes. 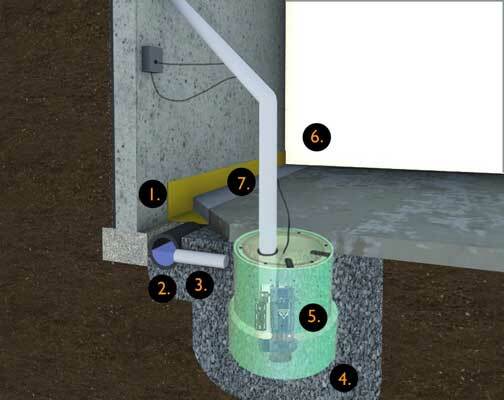 The system is designed to work in situations where the foundation walls are already allowing water into the basement. The system collects that water into a drainage system preventing the water from reaching the floor or staying inside of the foundation. But it is important, however, to understand that if you install this system, the water will still come down the walls. What if I am getting water in the basement from my window wells? We can tie a window well drain into the same system so any water which collects in the window well will be piped into the footing drain and diverted to the sump pump and away from the home. Can you tie a wall wrap in with the system? This same membrane system is also commonly installed in crawlspaces on both the walls and the floor. Can the DuraDry™ interior waterproofing system also be installed in crawlspaces? Yes it can! Contact us today to have an evaluator come out to your home to review your individual needs and provide an estimate. We do. It is a lifetime, transferrable warranty on water intrusion with the DuraDry™ system. We almost never have any issues with this type of system. It is extremely efficient at doing what it is designed to do. It sounds labor intensive to install. Is it? It really is. It involves breaking out concrete, digging dirt, and then getting that debris out of a basement. There is no way to use automated equipment for this, so the debris is removed from your basement in 5 gallon buckets. This is tedious and very strenuous work. (Our guys are extremely tough!) It also involves carrying gravel down in the same kind of buckets. We also have to transport concrete bags into the basement as well. The process is extremely labor intensive. We commonly hear how impressed customers are with how hard our guys work. Is it messy to install? Anytime you are jackhammering concrete, there is some mess and dust. We will protect any finished floors with a covering for the pathway into and out of the basement. We also put plastic tarps over any areas where we expect to generate dust, (Note: the jackhammering is also noisy.) and will put up plastic tarps to contain the dust in the area we are working in . Of course, that’s all the bad news. The good news is we do this every day, so we know how to protect your home, as well as clean up when we are done. This aspect is something we take a great deal of pride in. During the project, it does look like a mess (it has to in order to accomplish the project), but after we are complete, we will clean up before we go. Sounds like the sump pump is a critical part of the system. Is it? You are absolutely right; it is. A functioning, properly maintained sump pump is really the “heart” of the system. Most waterproofing systems rely on getting the water to the sump pump and pumped away from the home. It is so important that we often suggest installing a new sump pump in conjunction with the whole waterproofing system. If you plan to use your existing sump pump, we will need to ensure it has enough capacity and is in good enough condition to support the overall system. Can you install the DuraDry interior waterproofing system in finished basements? We actually can. We will remove the baseboards and work without removing the drywall. Of course, if we are installing the wall membrane / encapsulation with the system, we must get access to the foundation walls. But a “standard” DuraDry installation (without wall wrap) can be done without damaging finished (drywall) walls. What are other options if I want to prevent water from coming in the basement at all? As mentioned above, the interior waterproofing system relies on capturing water which comes down the wall and diverting it to a sump pump. Understandably, some people prefer a waterproofing system which prevents the water from entering the basement at all. We can do this with our exterior waterproofing system, which relies on excavating outside of the foundation wall, putting a waterproof membrane on the outside of the foundation, installing a new drain tile (pipe) and backfilling with gravel. (See our web page on this system. Coming soon!) This solution is more expensive, but many prefer it. We like both systems, as there are advantages to each. Can I do both an interior and exterior waterproofing system? Yes you can. This puts in multiple layers of protection to ensure your basement stays dry. What are the advantages of an interior waterproofing system? 1.) It is less expensive than an exterior waterproofing system. 2.) It is faster to install. 3.) There is no impact on the outside landscaping.